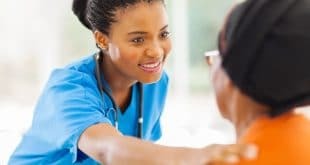 Psychiatric nurse practitioners serve as primary care mental health providers, and they play a large role in helping patients regain mental wellness. Diagnosis – Psychiatric nurse practitioners ask patients about their symptoms to determine a diagnosis and develop a treatment plan. To do this, they examine reasons for a psychiatric illness such as social issues, genetics, family dysfunction, or neurological trauma. 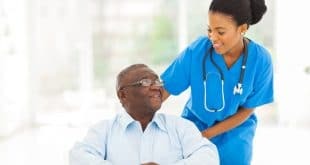 Treatment – Psychiatric nurses are able to treat patients using a range of options for psychotropic medications (under a psychiatrist’s supervision) and conducting group, family, or individual counseling. Working with Other Healthcare Professionals and Families – Another aspect of the job is monitoring patient progress and reporting the results to doctors such as psychologists and psychiatrists. They also teach patients’ families about mental illness, treatment options, and prevention. Where do Psychiatric Nurse Practitioners Work? Earn a Bachelor of Science in Nursing Degree – Courses in nursing degree programs often include Anatomy and Physiology, Health and Community Wellness, Pharmacology and Pathophysiology Basics, and Patient Health Assessment. Students who want to become psychiatric nurse practitioners should take electives that explain psychological illnesses, diagnostics, and treatment protocols. Obtain a State License – Each state requires nurses to obtain a license before practicing. This is done by passing the National Council Licensure Examination for Registered Nurses (NCLEX-RN) that’s administered by the National Council of State Boards of Nursing. Some states also have additional licensure requirements. Gain Experience – All accredited psychiatric nurse practitioner graduate programs require candidates to have at least one or two years of experience as a clinical psychiatric registered nurse before they can apply for admission. Nurses can meet this condition by practicing in areas such as inpatient mental health or geriatrics. 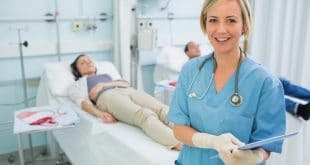 Many nurses who want to work as nurse practitioners choose to earn a Doctorate in Nursing degree because it increases employment opportunities. Certification – After obtaining a graduate degree, psychiatric nurse practitioners are required to earn certification through the American Nurses Credentialing Center. Nurses can choose certification in either adult or family psychiatric and mental health, and the exam covers patient relationships, disease prevention, patient assessment, and clinical management. Upon passing, nurse practitioners will earn their Family Psychiatric Mental-Health Nurse Practitioner-Board-Certified or Psychiatric-Mental Health Nurse Practitioner-Board-Certified Designation. Recertification is required every five years. Obtain State Licensure as a Nurse Practitioner – Nurse practitioners are required to earn a state license in addition to their registered nurse’s license. Requirements vary by state, but often include having a current RN license, a diploma from an accredited master’s degree program, and certification. The U.S. Bureau of Labor Statistics indicates that the general demand for nurse practitioners will rise thirty-four percent until 2022, and in 2014, the median wage for psychiatric nurse practitioners with $88,441. Psychiatric nurses have rewarding careers in which they can work part or full-time. To learn more about this healthcare field, please contact us.